The cooler weather has been nice, but it's the wet weather that is keeping us from doing too much exciting around here lately. The shed progress has halted, with tarp covering one of the frames, we'll wait for drier times to continue. 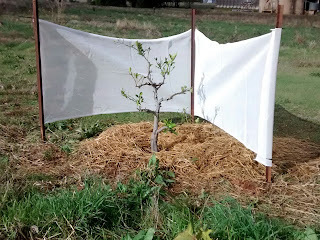 We went to the last Permie Day at Richard's place, and came home with an orphaned lemon tree. Poor little thing! There's one great thing about wet weather though - it's very easy to dig holes for trees. The tree is all tucked-in for the winter, and hopefully it recovers. There is a lot of compost in that soil, as well as a generous amount of worm juice and poultry manure (in pellet form from the bag, since we can't really collect our own chook manure the way they're set up now). There's been a lot of sitting by the fire, keeping warm. 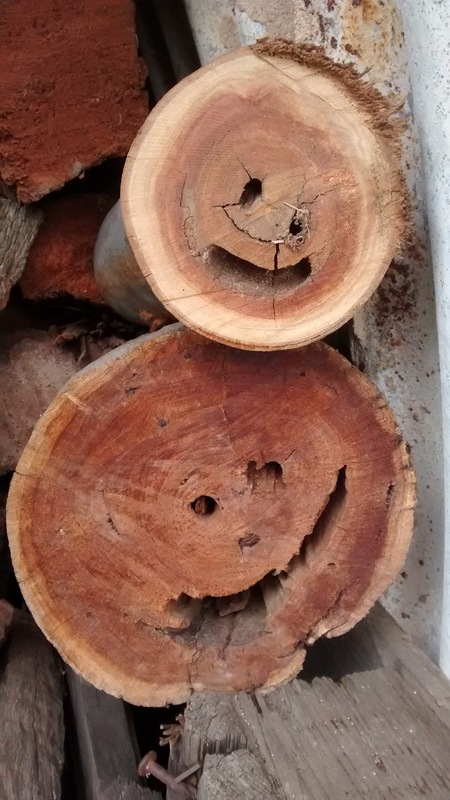 We keep any wood with holes in them for the garden, somewhere for the bugs, spiders and skinks to call home. Some make good garden edging, and others are huge and I'll garden around them. Gardening is a very slow process in Winter, which is a little frustrating, but I can't complain too much. Most everything is still alive, just hanging out for the warmer days. I've kept 3 jars of Kang Kong in the kitchen - with roots this year - just waiting for Spring, there's a sweet potato that sprouted too late last season, but might not live to see the Spring, and avocado seeds with toothpicks too. The fruit trees received a little love, we pruned the fig trees (just underneath them, taking out the suckers and dead stuff, not very dramatic this year), the almond trees got a very light prune, (just branches that were crossing over others and dead ones) and this year I've added mulch and some chicken manure around the bases. They didn't produce any almonds last year, so we're hoping they go crazy this year. Almonds are $36 per kilo at the moment! I don't imagine we'll get enough for our own needs, let alone selling them.